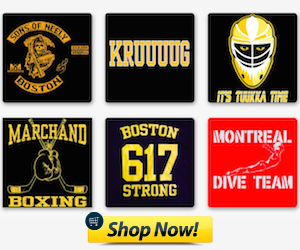 The off-season is underway in Boston, and everyone would much rather that not be the case. But the 2014 Stanley Cup playoffs march on, with the Bruins left behind to dissect the corpse of their fallen season. However, not all is lost! There's always room to look on the bright side and towards next season! OK, it's not as fun as getting ready for the next round of the playoffs, but it does provide an avenue to take the mind off of the sour end to the 2013-14 season for the Hub of Hockey. Of the many players to put forth disappointing performances in the short-lived 2014 playoffs for the Black and Gold (ahem, David Krejci, Brad Marchand, Matt Bartkowski), the trio of Hamilton, Krug and Soderberg really stood out in terms of making an impact. All three players took enormous steps towards making their claim that they can be long-term options for the Bruins for years to come. Paired with captain Zdeno Chara, Doug Hamilton recorded two goals and five assists for seven points, while skating to a plus-1 rating and averaging 19:07 time-on-ice versus the top competition from the other team. Krug led the Bruins in scoring, netting two goals and eight assists for 10 points and proved in his second go-around in the spring that his 5 foot 9 frame can hold up under the pressures of playoff hockey. Carl Soderberg was Boston's best player vs Montreal, as he morphed into a force of nature, utilizing his size, puck possession and vision to set up play after play, while at the same time using his smarts as a defensive player to backcheck and break up scoring chances. All three players will serve a crucial role for the Bruins in the upcoming season, and their play will only improve. One of the oft-forgotten aspects of making a deep Cup run is the physical toll it takes on the players as they trudge deeper and deeper into June. Playoff games are not ordinary games. There's the expression that one playoff game is equal to two regular season games, and it's hard to disagree with that notion. There's a reason why we haven't seen a repeat champion in nearly 20 years. Starting with their 2011 postseason, the Bruins have played 66 playoff games, including six Game 7's, in the past four years. That's massive amounts of wear and tear, both physically and mentally, on the B's that leaves the players beaten and broken at the end of it. We all remember the shape Patrice Bergeron was in when the season ended last year vs the 'Hawks. With the Bruins getting bounced relatively early this season, the players will be able to heal up and recover instead of taking more night to night beatings from the grind towards the Cup. General manger Peter Chiarelli did not make a significant move at the trade deadline to reinforce a depleted defensive unit, and instead opted to trade for spare parts in Andrej Meszaros and a non-factor in Corey Potter. With Dennis Seidenberg still in recovery from his knee surgery and Adam McQuaid plagued by setbacks in his own recovery, Chiarelli thought the Bruins had enough on the blueline in the form of Matt Bartkowski, Kevan Miller and the two pickups at the deadline to make a deep Cup run. Turns out they were dead wrong, as the Bruins never found a steady replacement on the second paring next to Johnny Boychuk. If you're keeping score, half of the Bruins starting lineup from the Cup final last June in Seidenberg, McQuaid and Andrew Ference did not play a single game this postseason. That's a lot of experience, muscle and minutes to go to battle without, and the lack of those elements killed the Bruins vs Montreal. 4. 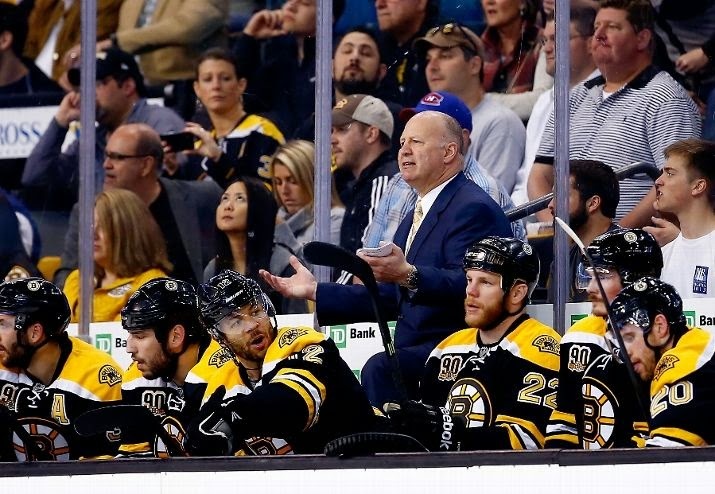 Extra motivation for next year, or the "Milan Lucic 'I'm going to fu*king kill you next year' factor"
As the extended title suggest, losing in 7 to the hated Canadiens can only serve to fuel the Bruins in the upcoming 2014-15 season. Entering the postseason as Presidents' Trophy winners, the Bruins had a huge target on their backs for other teams to aim for. With the Canadiens getting the better of Boston in Round 2, the B's know they sold themselves short by playing their worst hockey of the season at the worst time possible. They know they blew a tremendous opportunity to play for another Stanley Cup with their poor play, and hopefully it will serve as a reminder about how quickly things can change when they take their foot off the gas, or in the case of Games 6 and 7, never put their foot on the gas. Milan Lucic will be driving the revenge bus for the Black and Gold, as we were given a pretty good look into the mindset of #17 in the much-talked about Game 7 postgame handshake line. Lucic and the rest of the Bruins should have a picture of him telling Weise to piss off (in lesser words) above his bed to remind themselves every single day of the extremely disappointing end to their season. Playoff games are not fun. They're extraordinarily frustrating, filled with nerves, stomach knots and sequences of despair. With the Bruins out of the tournament, we now don't have to worry about being down in a 2-1 series waiting for Game 4 to be played on the road, or cursing out the ref for calling a bullcrap hooking penalty in the defensive zone with the puck up the ice, or having to hold your breathe with every shot in overtime. We get a reprieve from the torture and instead get to watch other teams continue to beat the hell out of each other shift by shift. Some of you may not be able to stomach watching the Canadiens and Rangers duke it out when knowing that if the Bruins had showed up once or twice in Round 2, it could be them in the Eastern Final. 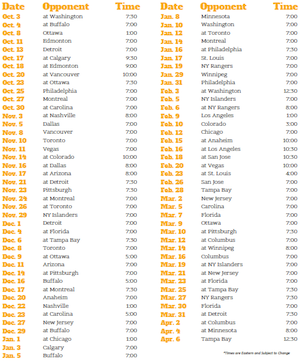 But if you're a hockey chronic, like me, you'll find the time to take in the last remaining weeks of hockey. And of course to cheer for the Canadiens to lose every game as badly as possible. Trying to find a silver lining to the most dire of situations is never easy, but it can provide a bit of peace to a tormented mind. The Bruins didn't play well enough to deserve a spot in the Eastern final, even though they were the better team and should have been there. But hey! There's always next year!